White Wolf : Police make a woman sit in the hot car she had left her dog in. Police make a woman sit in the hot car she had left her dog in. The police officer decided to write her a ticket, and asked her to wait in her car is since, according to her, it wasn’t that hot. The police officer called her “callous”. 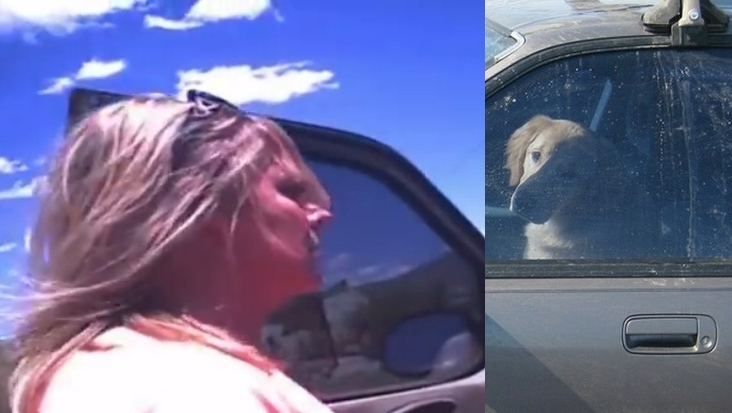 She called what he did “abusive”, but when the woman who admitted to leaving her dog in a hot car called a news station to complain, she ended up with a dose of karma instead. KOB News investigated what happened and after the woman asked the news channel to look into her complaint against the officer, saying that he forced her to sit in the hot car she had left her dog in. Officer Vincent Kreischer noticed a dog inside a parked truck at a grocery store’s parking lot in Truth or Consequence, New Mexico, with the temperatures outside of over 90 degrees Fahrenheit and confronted the owner. The woman told him she only left the dog for 10 minutes, and began to argue with him about how hot it really was. But Officer Kreischer estimated that inside the vehicle would be 114 degrees after that length of time. When he confronted her, he says she shrugged it off with a laugh and was “callous and carefree” about her dog’s welfare. That’s when he took action. He decided to write her a ticket, and asked her to wait in her car is since, according to her, it wasn’t that hot. Responses to "Police make a woman sit in the hot car she had left her dog in." Good for that police officer! I wished more would do the same. Sweet! Kudos to the police officer. GOOD for the Officer. That woman is utter scum. She clearly has no regards to the safety of her Dog. She should not be allowed to own an animal if that is her attitude. The officer was factual and polite. YES she should be made to sit in the same car(with the dog removed) closed in for 10minutes or longer to understand the seriousness..yet even then its not comparable as the Dog is wearing a fur coat inthat extreme heat also. She is total utter scum. Good for him. I like the way he made his point and was looking out for the welfare of the dog. Thumbs up for the police officer to take action! !